Windows Vista and Windows 7 moving the user folders was pretty easy. You would click Start, select your name and you would be at your personal folder location. Without the start button, Windows 8 has an extra step after that it is easy. From the Desktop section click on the System Folder with your profile name on it. You may get a prompt to move the folder, I typically choose yes. Excellent tip. thanks very much. Pingback: SSD Woes - still a pain even with the newest OS! What flavor are you running and are you on a domain? 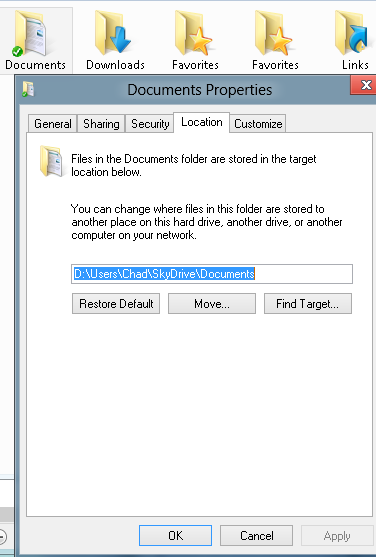 If you are on a domain there is a group policy that can be turned on to hide the location tab. Ctrl-x and Ctrl-v will do the job in one time for all the folders you want to move. When I right-click my user profile folder, there is no properties option. I’m using Windows 8 Pro. No properties option either. Running Windows 8 OEM. (not professional). Maybe you’re misunderstanding what the author meant. I don’t think Chad was saying that you right-click on the system folder with your profile name, but right-clicking on the individual ‘Documents’, ‘Pictures’, ‘Video’, etc. folders. That is where the ‘Properties’ tab is. Which is way more involved. My brotherr recommended I would possibly like this blog.